In middle school, Jafar Hussein wasn’t the best student. He failed math in the eighth grade and was almost kicked out of his honors math class. But currently, in eleventh grade, Jafar has never received anything less than an A in math since starting high school. 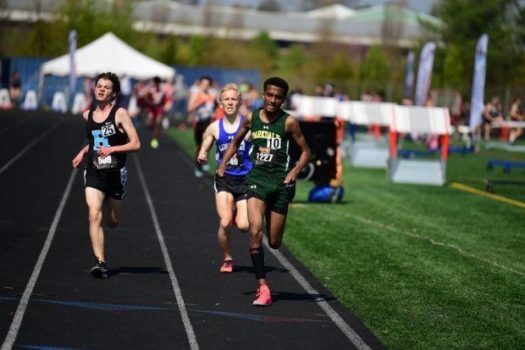 Hussein hasn’t been winning running trophies and medals his entire life, as it was the summer before his freshman year when Hussein went to his first cross country practice. After being encouraged by a friend who was already running, Hussein decided to give the sport a try and quickly realized how “brutal”, according to him, it was to be good. Despite the brutality of those first few practices freshman year, the athlete has seen considerable growth since that first day three years ago. “My 5k time I went from about 23 minutes unofficially to 17:08 officially on the Fort Washington course,” Hussein said. Although running took up much of his time, Hussein’s parents ensured that he was always adhering to the requirements and assignments needed to keep up with his grades. Hussein’s brother and father very much encouraged him to be involved and thrive in the sport, but education was emphasized as equally important. While most students would find it difficult to juggle school and sports, especially with the workload and effort required to be successful in the IB program. However, Hussein actually attributes sports to reason for his academic improvement since middle school, and improvement that went from failing eighth to thriving in pre-calculus. In order to be an athlete in PGCPS, students must have and maintain an average GPA of 2.0. Hussein exceeds these expectations with his 4.8 GPA.. When it comes to performance on the track, Hussein isn’t slacking in that department either. During the 2018 cross country season, Hussein won both county and regional championships as an individual while also ranking top 40 in the state championships. Although much of Hussein’s successes are directly linked to his own academics and sportsmanship, he also ensures that he makes time for others, as well. Hussein is an active in his community as he works monthly at his local food pantry at Charles Carroll Middle School, preparing donated food to be given out the less fortunate. “At the food pantry I direct people to a certain position where they should volunteer where I feel like they can help the most,” said Hussein. Sports will not be his only focus in the future, however. Keeping the encouragement and emphasis on education from his parents, Hussein intends on continuing the balance of athletics and academics into his collegiate years. Hussein still hold his love of running but also has different career paths he would want to pursue. When reflecting back on his time at Parkdale, Hussein seems to look at the school with much brighter lenses than some of his peers. After witnessing, mid-interview, food and trash being thrown across the cafeteria, Hussein took this as a notice to not recoil from his school but make it better. “I have to become an individual who leads himself to a future he would be happy with,” Hussein said.